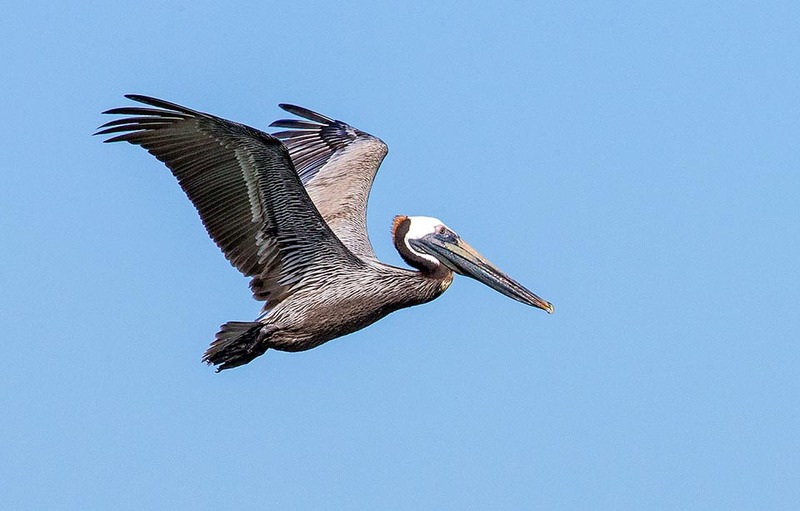 The Brown pelican ( Pelecanus occidentalis Linnaeus, 1766) is a big bird belonging to the order of the Pelecaniformes and to the family of the Pelecanidae and although it has remarkable dimensions and an important weight, it is the smallest member of the family. The originality and the morphological oddity of these birds, well known in the whole world, have necessarily generated a separate and well distinct classification, even if the number of the species belonging to this genus gets only to eight, in all the world. Awkward and clumsy on the ground, due to the abnormal and stubby dimensions of its body, it reveals conversely a real mastery in its flight and in the air evolutions. Great and agile glider it knows how to get the best advantage from the thermals, often reaching unbelievable heights until it disappears from view. Very good exploiter in the flight in group, we see it making in the sky V shaped formations with such a precision that exceeds widely the traditional and specialized migrators like the common cranes (Grus grus) or the graylag geese (Anser anser), forming in the sky very long lines fluctuating in the sky while following the trail drawn by the leader. Moreover and with greater mastery and in particular for this species, here it is gliding against the wind at high speed and with the wings totally spread, a few centimetres from the surface of the water almost to touch it, climbing up and down the waves as if it should be steered by an automatic altimetre that maintains constant its distance from the surface. Then suddenly, it stops and climbs fast for a ten metres and turning on itself with an acrobatic caper, to slip into the water below like an arrow with the wings stretched backwards to sink completely and then rise again little later with the throat pouch full of water but also of the fish it had suddenly seen. As much as it is artist and elegant when flying, so much it is awkward and clumsy when on the soil. A big goose gait, with accentuated swinging of the body and the waving of the big neck, of the immense head and of the disproportionate bill. As a matter of fact, this bird has, as we shall see, all the parts of its body out of size. Already these particulars by sure had not escaped to the ancient Geeks when they named it with the name of “pelekanus” from “pelekys” = ax, due to the huge bill from whose lower mandible hangs an enormous throat pouch that may appear in the silhouette, the blade of big ax. All vulgar names given in the various languages remind this name. 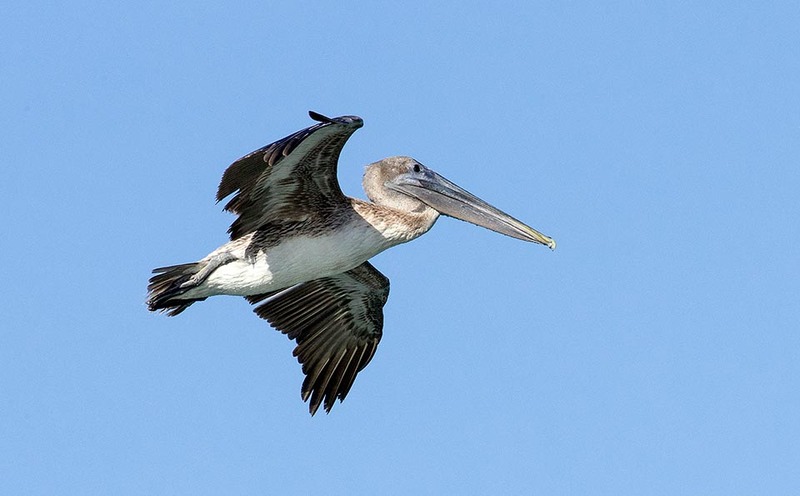 In English Brown pelican, in German Braunpelikan, un Spanish Pelícano Pardo, in French Pélican brun, in Portuguese Pelicano-pardo and in Italian Pellicano bruno. Also when floating this bird has a natural elegance, helped also by the big air pouches its body has. Like a swan it glides on the water creating only a slight ripple of the surface though with a speed well higher than any other bird seen the power expressed by the huge webbed feet that, like mighty oars can easily and elegantly move such a massive body. It often sleeps on the water tucking the big bill under a wing and rocking gently with the waves. 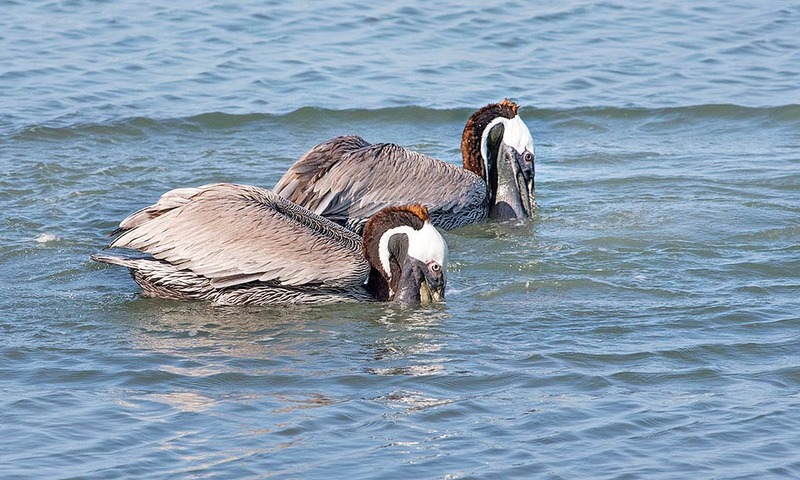 But in the genus Pelecanus the elegance is even more evident during the group fishing done together its similars! Side by side, here they are advancing coupled over the water and with synchronous simultaneous movements immersing the big bills and little later rising them up with the throat pouches full of water and of the ill-fated fishes stumbled in this methodic hunting trapping. More dance than hunt, fruitful in its results but spectacular in the vision. 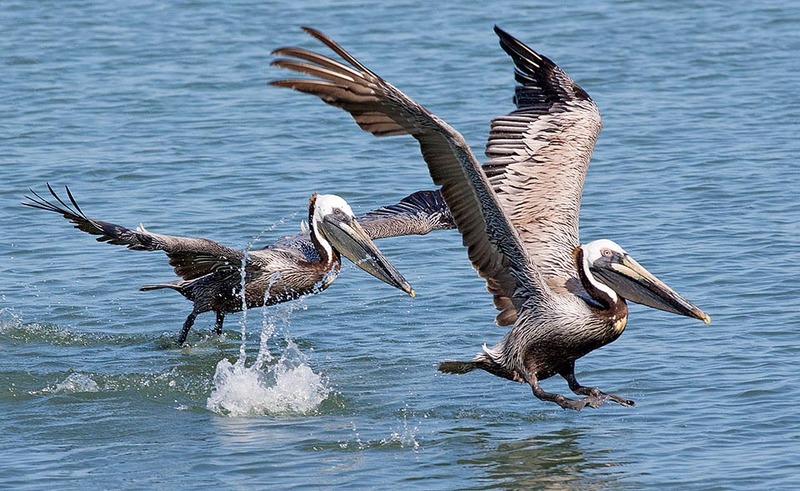 The brown pelican occupies most of the coasts of both oceans touching the American continent. On the Atlantic coast it moves northwards up to New Scotland in Canada, occupying diffusely all the coastline southwards up to north-eastern coast of Brazil, indicatively at the height of the mouth of the Amazon River, including totally the basin of the Caribbean Gulf and all its islands. On the Pacific coast starting from British Columbia always in Canada, getting to touch Peru including the Galapagos Islands. A very vast and densely populated area during the whole year, even if some populations show short range provisional movements with interchange and overlapping of the populations native to the single regions, in particular during the winter when the specimens of the extreme north go down to lesser latitudes. 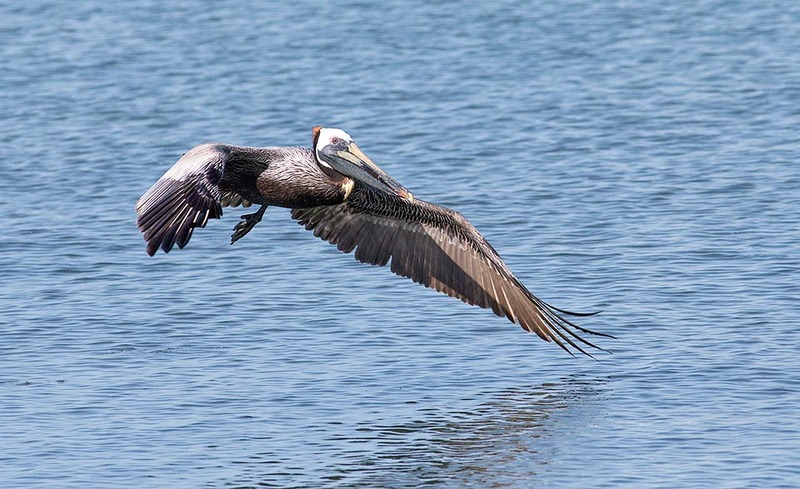 The brown pelican is a seabird and it is unlikely to meet it, albeit little, far away from the coasts. Its presence is easy to detect due to the continuous comings and goings along the coasts looking for food, as well as for the usual permanence on all the supports and the artifacts overlooking the sea. It is a typical inhabitant of the harbours, the piers and of the embarcaderos, of the anchored boats, of the marine industrial platforms or of possible wrecks near to the coast. Habitats it has duly learnt to frequent often defying the rage of the people living in those sites as, besides the continuous soiling with their abundant and stinking guano, also for the insistence pouncing on any edible thing passing under their eyes. It is not rare to see them swooping suddenly on board of the fishermen’s boats to take the catches left at their feet, without showing any restraint or fear of the present persons. By sure, it has become intrusive and sometimes supernumerary, in particular near the location of fishing or of processing fish products. He learnt with precision hours, times and modes for reaching pre-arranged places where they may take advantage of processing wastes. 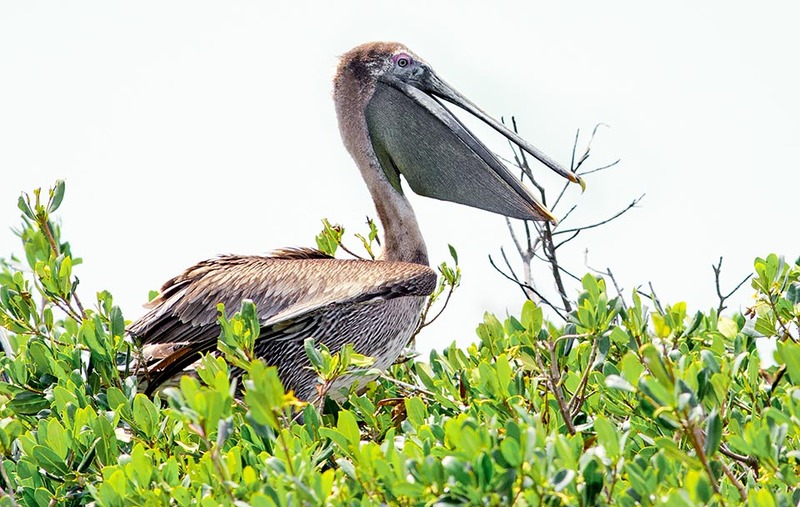 Outside these anthropized sites, this pelican loves marine environments with not deep waters, mouths of rivers, mangroves, sheltered beaches and muddy banks. 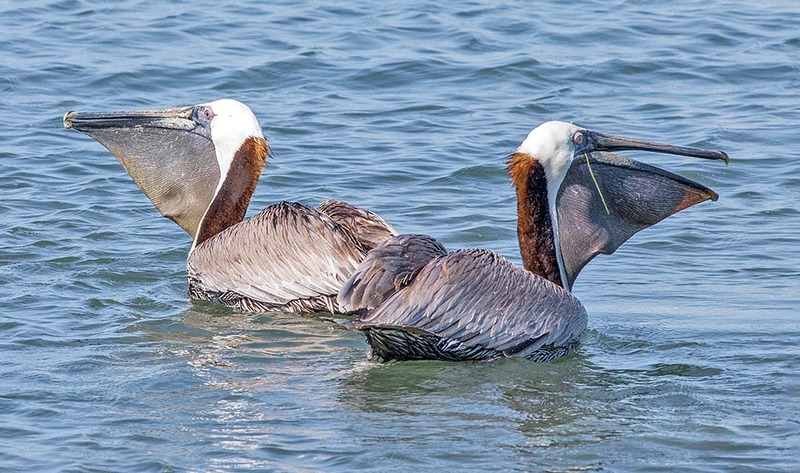 The brown pelican is one of the three species present in the new continent together with the Peruvian pelican ( Pelecanus thagus ) and the American white pelican and ( Pelecanus erythrorhynchos ) among these it results being the smallest one. However, it has a total length of more than 120 cm of which about 35 of the only bill, an average weight of 4 kg with tops of even more than 5 kg and a wingspan reaching the 250 cm. A weight of about one half of its American congeners. 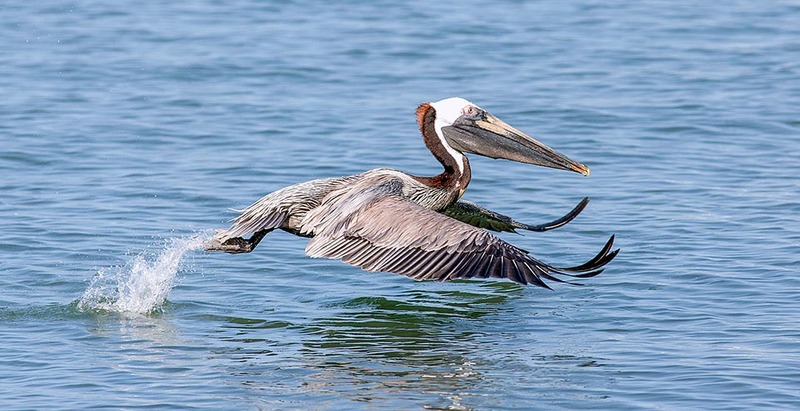 It turns out to be one of the few pelicans practicing habitually the dive fishing previously described even if some American species have been at times observed while displaying the same hunting behavior. The bill and the head are the two more characteristic elements of this bird as well as of its congeners scattered all over the world. The bill besides being very long, as if it were an enormous spoon suitable for collecting the greater quantity of water while fishing, helped in this function by a pouch of elastic skin and extensible that hanging from the lower mandible increases even more the capacity of this container. 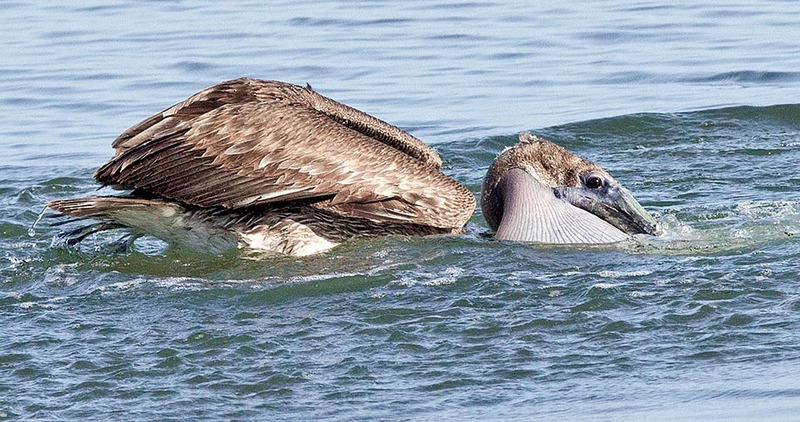 A tool the pelican uses as if it were a net and that, as result of an evolutionary convergence, makes it looking strangely during the fishing, to the huge mouth of the whales: expelled the water filtering it between the two mandibles, gobble the seized preys. The bill is equipped with a terrible and very hard claw, strong and sharp that it uses for holding the bigger preys. The head is oversized, also if compared to the already enormous dimensions of this bird. On the other hand, in order to support the weight of such a bill that when full of water may weigh several kilos, it must have an exceptional musculature implanted on the skull of the proper proportions. The body is massive and stocky and is governed by short and powerful legs, having webbed feet of enormous size, as if they were fake fins. Exceptional measures for each single part of this powerful machine. In the nuptial livery, the upper cover and all the body up to the tail are widely of brown grey colour whilst the head and the throat are candid white. 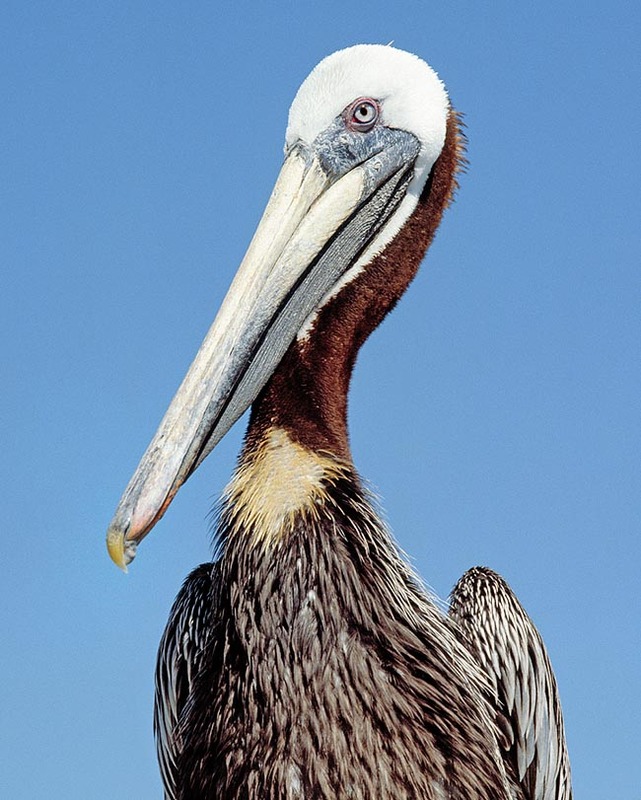 The neck, starting from the nape and for all its length, is conversely is of a very bright chestnut brownish colour with a crest formed by short feathers of chestnut colour, an erectile ripple that from the occiput goes down per a twenty centimetres on the nape, characteristic from which has come the vulgar name of brown pelican. Light bluish grey bill and very black paws. Eyes surrounded by bare skin of pink colour, with light bluish iris tending grey. Females and males cannot be distinguished though the female has markedly minor dimensions. During the post nesting period the neck loses completely the brown colour and becomes totally whitish even if maintaining, in the period preceding the moult of the nuptial livery, a yellowish colouration on the nape, in correspondence to the crest. The immatures have a plumage quite similar to the adults, with a bigger quantity of brown in all the body but a greyish abdomen and paler than the mature specimens. Various subspecies have been determined mostly linked to specific belts of occupied territory. We count the Pelecanus occidentalis carolinensis of the Atlantic USA coast and through part of the Caribbean Gulf up to the Pacific coasts of Honduras up to Panama; the Pelecanus occidentalis californicus proper of the coasts of the Pacific Ocean, from the northern limit of the range up to Mexico; the Pelecanus occidentalis occidentalis typically Atlantic that occupies the Caribbean up to Columbia, Venezuela, the three Guianas and the north of Brazil; the Pelecanus occidentalis murphyi of the extreme south range of Pacific and the Pelecanus occidentalis urinator of the Galapagos. Many of the species hybridize with each other in the overlapping points. 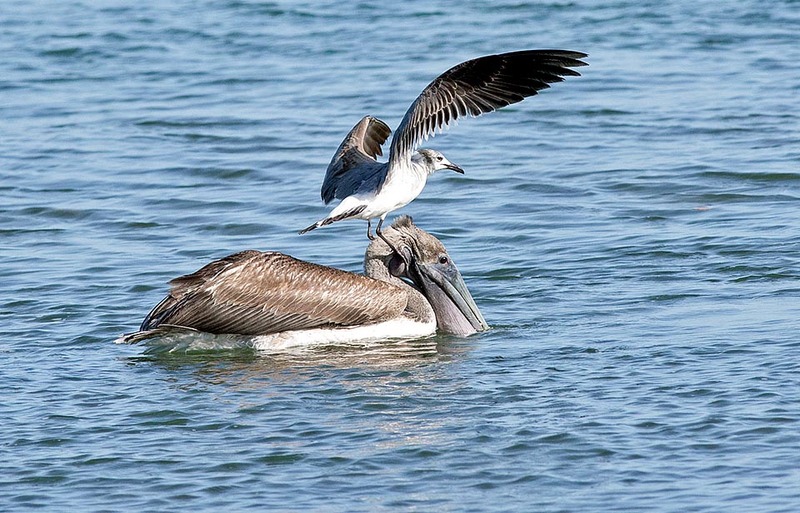 The Pelecanus occidentalis is a monogamous species only for the season of reproduction. It mainly nests in colonies but at times also isolated and always in sites close or facing water surfaces. The platform is formed by big branches, sedges, roots and dried grasses, piled on the branches of low trees and even on the soil in places having no terrestrial preys, in any case never at a height over 3/4 metres from the soil. Are laid two/three big eggs of white colour that are brooded for about 4 weeks by both partners but the nestlings will not be able to fly for nine weeks more. However, they will get out from the nest after about 40 days remaining on the brushwood close to the nest waiting for the moment of the flying off. 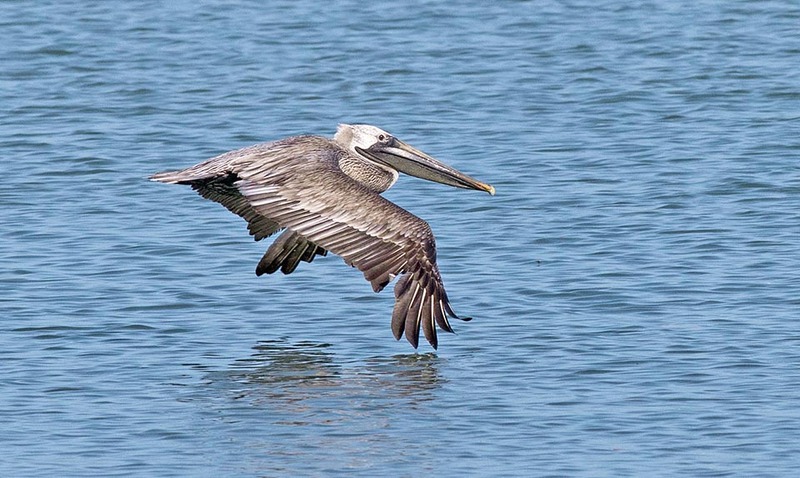 With such a long reproductive cycle it is natural that this pelican does only one brooding in a year. It is not very vociferous but when it emits its cry is quite noisy and can be heard form far away. 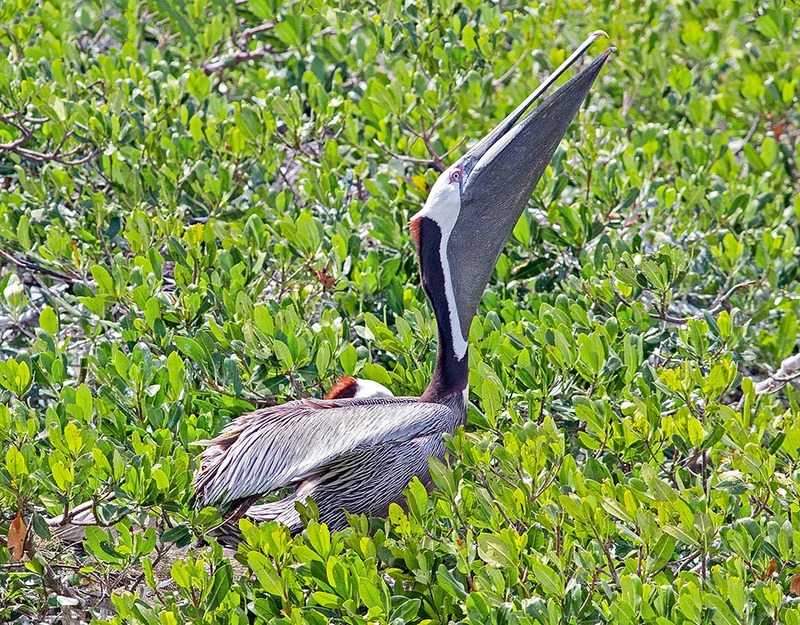 The brown pelican is mainly piscivorous even if it does not disdain amphibians, mollusks and crustaceans but is also an opportunist and eats occasionally small nestling of other birds and also their eggs. 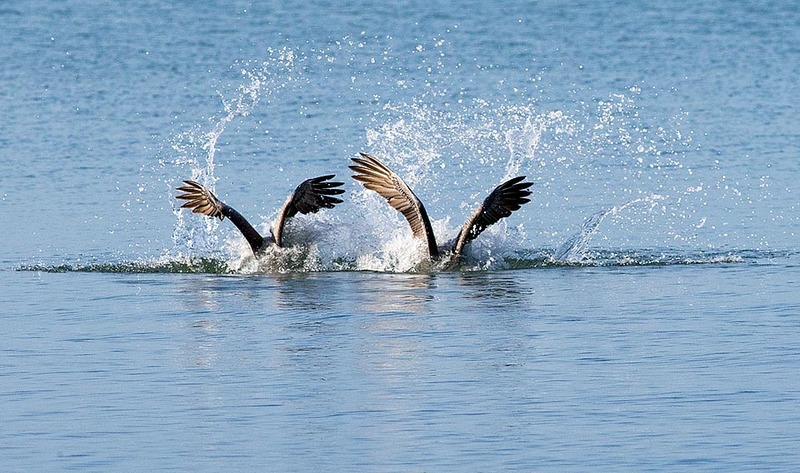 Its habit of fishing by diving vertically into the water, is surely not risk free. Various kilos projected at not least than 60 km/h against a surface absolutely not soft, causes an abrupt impact and a shock that is not always well overcome, particularly in the young novices. Are not rare injuries or damages to the specimen who has not yet perfectly learnt how to effect this adventure, even if this bird is endowed of air pouches of notable capacity that lessen the strong impact with the water. The bill becomes the force point in this operation as it must penetrate vertically in way to guide the whole body during the entrance in water. An improper penetration causes unfailingly an abrupt deviation of the trajectory with an abnormal movement of the neck and of the cervical vertebrae, with inevitable damage. It seems that the impact of such a mass stuns momentarily the fishes hit by the shock wave, facilitating their catching. 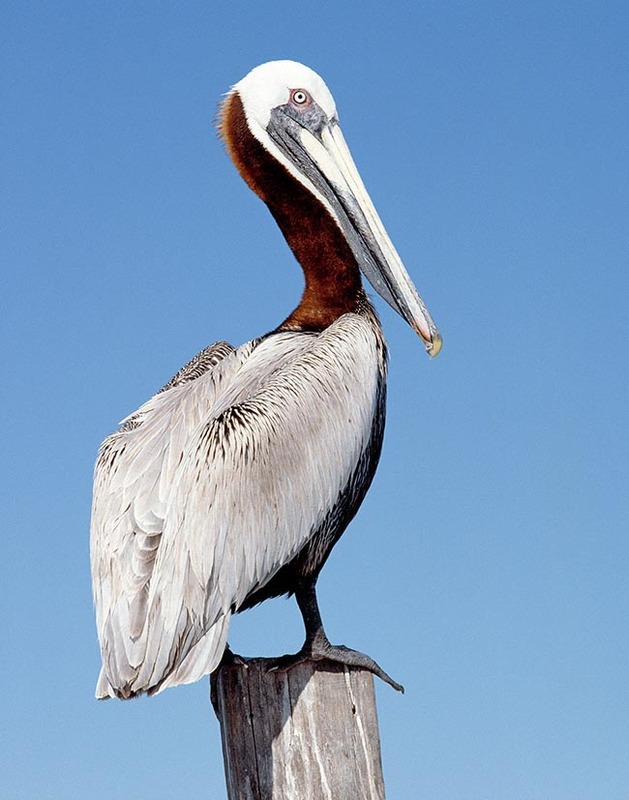 The pelican has a strong symbology in the religion and well as in heraldry and also in the social aspect. After the Christian religion it represents the symbol of the charity and goodness but also of the love of Christ for the human beings. 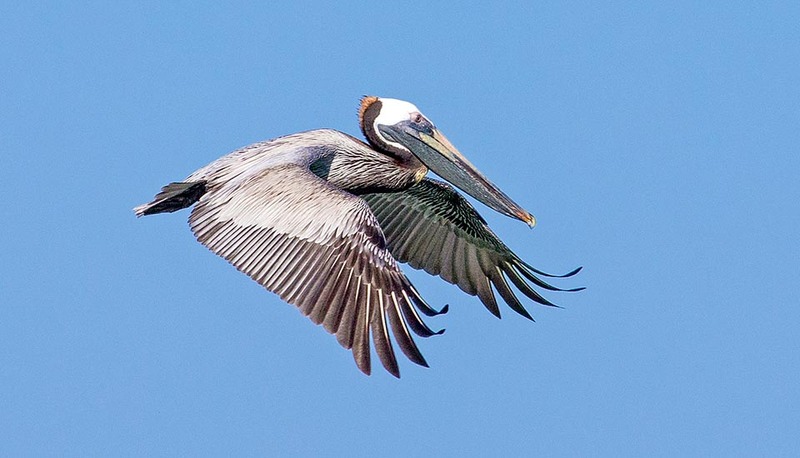 In heraldry the pelican represents the piety and charity toward the neighbour. In the story and in the social aspect this bird assumes different configurations but always deriving from a wrong interpretation or, better, in the elation of its lovingly behaviour toward the young. Since from the Middle Ages, period of editions of a good number of even fantastic bestiaries, the pelican is always recalled for its maternal aspect at the limit of the sacrifice. When this bird feeds the nestlings, it keeps the lower mandible leaning on the chest and opens it wide in way that the nestlings by entering their own into the pouch, take the regurgitated foods and now minced. With this action it dirt irretrievably of reddish the candid feathers of the chest making it looking like a voluntary bleeding. Hence, emphasizing, a mother that with a sacrifice of its life, nourishes the sons with its own blood! Also the Italian blood donors of AVIS have taken as logo a pelican that is bleeding: an animal that gives its blood to raise its own nestlings. Finally, in the regional folklore, various Caribbean insular countries have adopted this species as national bird whilst it appears even in the flag of the state of Louisiana and also as coat-of-arms in several North American university and sport associations. 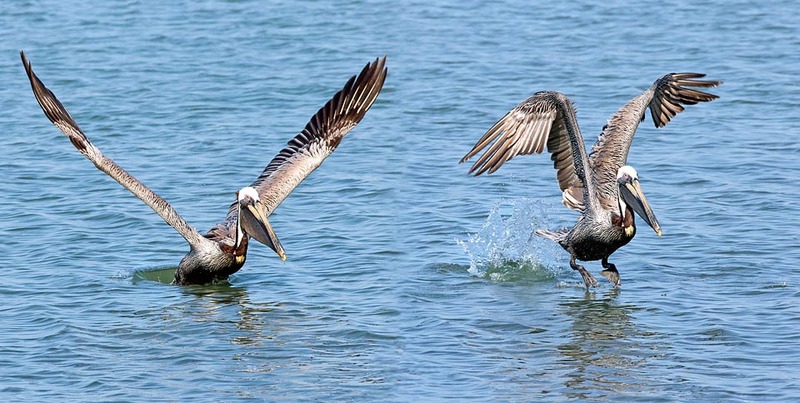 The brown pelican is occasionally predated by big birds such as big seagulls ( Larus spp.) and the Magnificent frigate bird ( Fregata magnificens ) but also by raccoons (Procyon lotor) and by alligators (Alligator mississippiensis) but actually is not object of menaces such to render the species vulnerable.